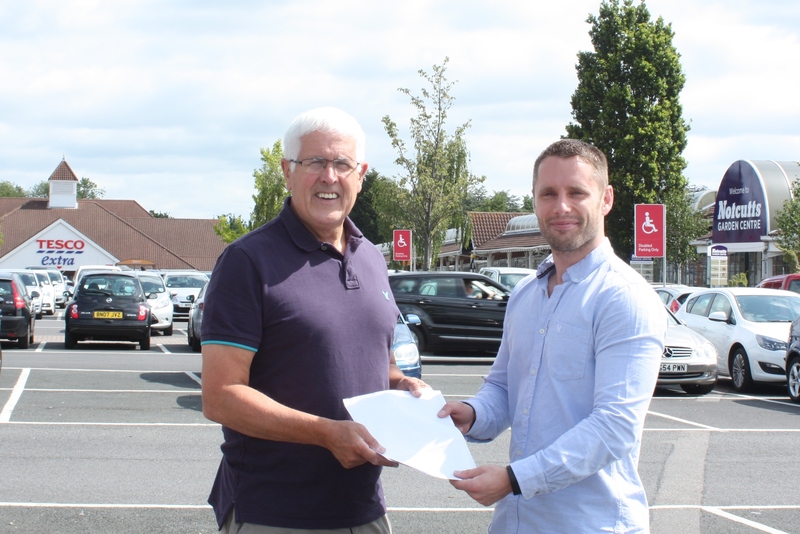 On Tuesday 14 July I presented to Solihull Council the petition, then signed by 277 people, seeking action by the Council, Police and Tesco’s/Notcutts to stop the congregation of vehicles which leads to anti-social behaviour (the image shows myself and ward action team member and Monkspath resident, Alex Insley, with the petition on the car park). Incidentally, it is the first on-line petition presented to Solihull Council by a Councillor and many thanks to all who supported it. My two letters to both Tesco’s and Notcutts had gone unanswered, however I did manage to communicate with heir head offices and this may have ‘motivated’ the manager of Tesco’s to agree to a meeting, held at the store on Friday, which was organised by local police officers; it appears Tesco does own the whole of the car park. I thank Solihull Police for taking up our call for action. You may have read about their success in operations conducted in local newspapers. However, they can not sustain the resources deployed so a long term solution must be found. There are two issues here; one is to stop the issue in and around the Stratford Road, but also to stop them from just driving to somewhere else in the borough. The meeting was attended by myself, Matt Gardner (Council Neighbourhood Officer), Manager and Community Manager of Tesco’s, Inspector Alan Green, PCSO Wendy Shale and a Pc Chris (sorry forgot surname) who is tasked with sorting this out. Tesco’s manager stated he was unaware of the problem, although he did state he had been at the store for 6 years. It is fair to state he now knows the extent of the problem and that we expect the company to take positive action and can not just refer the problem to the police. I did stress that because of the two unanswered letters my next petition would be to call for a closure of the car park at night time over the weekends under new anti-social behaviour legislation (part of the 2003 Act has now been updated for this purpose, read here: http://www.cps.gov.uk/legal/a_to_c/closure_of_premises_associated_with_persistent_disorder_or_nuisance/ ). Police mentioned number plate recognition cameras that the store could use, together with more effective CCTV. We also suggested that their security staff should be more proactive, especially when vehicles start to congregate (we do appreciate though they should not be so proactive when there are many vehicles, to ensure their own safety). I believe Tesco have not done anywhere near enough to tackle this issue and their managers have buried their heads in the sand. However, I read out some of the comments shown on the petition, especially those relating to the fear of customers going to the store and being confronted by hundreds of vehicles and youths. The company must recognise the potential danger to their customers and staff as well as the nuisance the boy racers create to their neighbours. Issues such as car park geography and installing barriers etc, to make it difficult for vehicles to be driven fast around the car park were discussed. I suggested an immediate task the store could do – erecting a sign asking all car park users to behave and not cause harassment, alarm or distress to other car park users or neighbours. This would go some way in establishing a ‘pre-warning’ and help to provide a case when drivers are identified if seen flouting this. We are meeting again in three weeks time. In the meantime the manager will examine CCTV to see the issue for himself ( the police stated they can provide him with recordings as they have plenty for him). He will also liaise with Tesco’s legal team to see what can be done. We all stressed the need for some positive action. I will urge the council and police to adopt a strong line and seek a sustainable solution for the whole of the borough and report back to you when I hear more. Please do not hesitate to make a comment. Thanks Ken for taking the lead on this, much appreciated. If left unchecked, perhaps to grow further, won’t this eventually affect Tesco in lost sales, as customers are put off from shopping; does the local store management recognise this could happen? in the longer term it would be in their interest to be a proactive part of a solution.